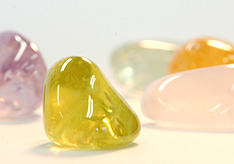 We propose a "life with natural stones" where the combination of knowledge on natural stones and ways of designing the stones into accessories can give you a sense of being connected to nature while living in the city. It is said that in October on the lunar calendar the gods of Japan gather in Izumo to discuss about "en" (fate, bond, relation, etc.) between people or people and things in the coming year.At the end of the meeting is the karasade festival and upon the termination of the festival, the gods would bring the many en or fuku (good fortune) back to their own dominions with them. The name of our store, karasade, is thus named with the hope that you will find gorgeous stones with which you feel an en attachment and bring them home with you. 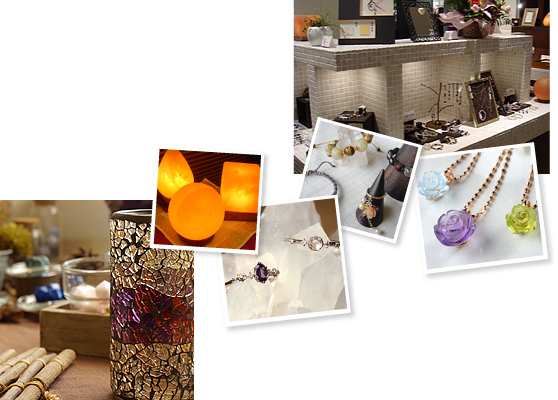 At karasade, we make original natural stone accessories using your lucky birthday color, your favorite sayings and design for customers looking for cute and pretty accessories that uniquely represent them.Besides accessories, we also have many items that can be used in various scenes of everyday life, such as lamps made with natural stones to gently shine light for you when you are relaxing at home, or even bath salts and aroma candles that you can use to relax your exhausted body as you enjoy your bathing time. Even the same type of beautiful stone crystallized over hundreds of millions of years can each have a completely different look.Take your time in the store's relaxed ambience to slowly select from the items that are created by taking maximum advantage of the qualities of the stones.